Feel free to shop around but once you are sick and tired of comparing prices, you will come to the conclusion that we are the company you should have called first. What we offer is a man and van service that is available in London seven days a week. We are always ready to provide you with efficiency, loyalty and affordability our current customers are used to. Whenever you need a helping hand and a team of responsible associated to carry your items from one location to another, don’t hesitate to opt for our professionalism and reliability. You may rest assured that our technicians are experienced and they will handle your items with utmost care. Even if you want something fragile to be delivered, we guarantee that we will take the measures necessary in order to protect your expensive possessions. The vehicles we use are spacious and the professionals we employ are well aware of the importance of delivering your piece of furniture, electronics or any other item intact. 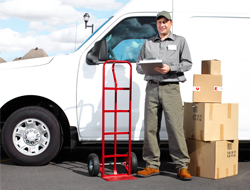 The financial aspect should not be a bother as well because our man and van services are affordable to everyone who wants to finish removal procedure without unnecessary hassle. All you are supposed to do is to contact us and ask for availability in London. We will do our best to adjust our schedule in accordance to yours and our technicians will come to your property at a convenient day and time. All your items will be quickly loaded and delivered to the new location in the same excellent condition they were before the loading. No scratches, damages or misunderstandings. Transparent, efficient and affordable service. Don’t miss such a great deal. Contact our call centre supporters who will gladly lead you through the booking procedure.